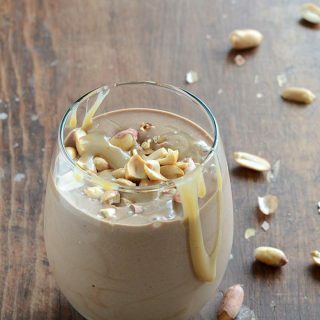 This thick and rich Healthy Paleo-Friendly Snickers Smoothie with chocolate, caramel sauce, and salted peanuts will have you convinced you’re eating ice cream when it’s actually healthy enough for breakfast. What if I told you it’s easy to transform a banana and just a few other ingredients (which are mostly just fridge and/or pantry staples) into something that tastes like both a milkshake and a candy bar? Welcome to the world of smoothies. In its most basic form, a smoothie is just fruit blended with a bit of liquid to make a thick drink. Smoothies can be used as a vehicle to help you get more fresh produce into your diet, or to help you clean out the fridge (a lot of people just blend up whatever they have on hand). Frozen fruit is also a great option, and fresh vegetables can also be added. Personally, I like to come up with smoothie flavor profiles that are healthy versions of classic treats…like a Snickers candy bar remade into a heathy, but decadent milkshake-like treat that can be enjoyed for breakfast or dessert! There are so many different ways you can make a thick smoothie! The first way is to use less liquid. If you have a high-speed blender (I love my Vitamix), you can blend ice in (like they do at Starbucks!). You can freeze your fruit before blending up your smoothie. Thickeners, such as oats, chia seeds, flaxseeds, or nuts, can also be blended in. Also, be sure not to over-blend it! These tricks also help prevent your smoothie from being watered down as it sits for a couple minutes after being blended (although, let’s be real, a smoothie is best consumed within the first 20 minutes or so after making it!). At this point, I think just about everyone on the planet (or at least everyone with internet access) has heard of banana soft serve, right? (Side Note: The first time I heard of banana soft serve was over on Gena’s blog, The Full Helping. I was hooked ever since!) Banana soft serve is basically the base of this smoothie, with just a little liquid added in to keep the consistency super thick and creamy. We all know the basic components of a Snickers bar: chocolate, nougat, caramel, and peanuts. 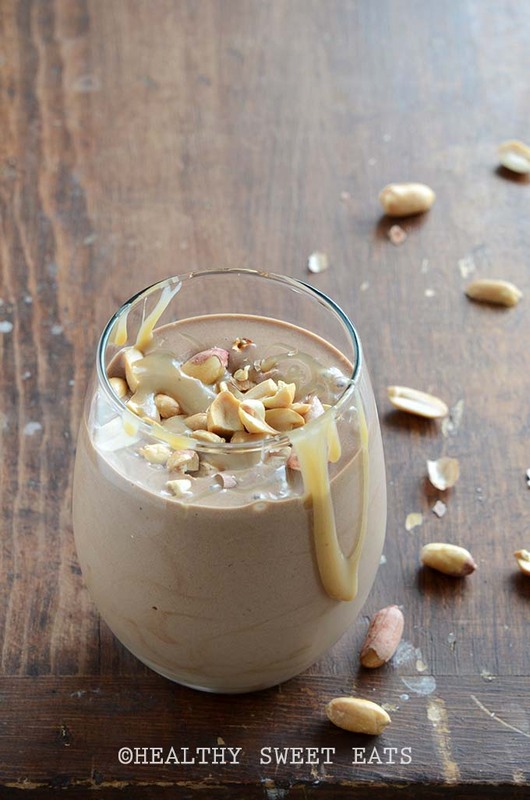 This smoothie has it all; a chocolate-flavored shake with caramel sauce and salted peanuts. You might be wondering where the nougat aspect comes in; it’s in the luscious texture of the drink that comes from using frozen banana! When I make smoothies, I try to avoid adding extra sugar if possible (although sometimes a touch of honey or maple syrup is a delicious addition). I have a couple tips: 1) make sure your fruit is ripe (because it’s sweeter), and 2) I prefer stevia when I want to add sweet flavor without adding sugar. For this recipe, I also added a homemade caramel sauce (I used my recipe for Salted Coconut Caramel Sauce that’s on my other blog, An Edible Mosaic), but you can use your favorite brand of store-bought caramel sauce instead. Note that just 1 tablespoon of caramel sauce contributes about half of the sugar in this recipe, so an easy way to make this smoothie lower in sugar and carbs is to omit the caramel sauce or use a sugar-free option. Use my recipe for homemade Salted Coconut Caramel Sauce, and use almonds instead of peanuts. 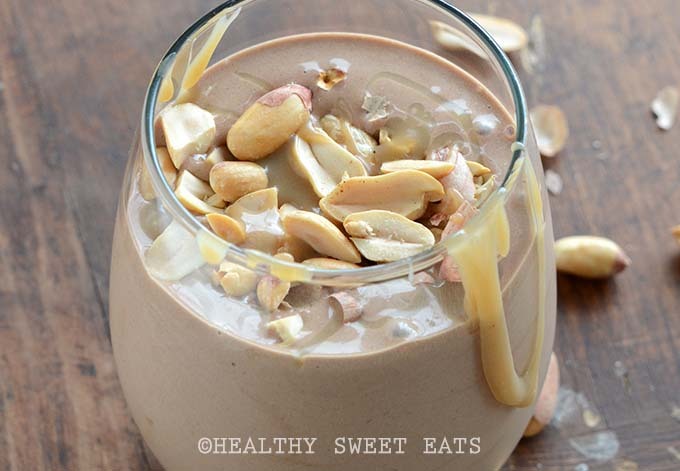 Add all ingredients except the caramel sauce and peanuts to a blender in the order listed and process until smooth and creamy. Transfer to a glass and top with the caramel sauce and peanuts. To Lower the Sugar and Carbs: Just 1 tablespoon of caramel sauce contributes about half of the sugar in this recipe, so an easy way to make this smoothie lower in sugar and carbs is to omit the caramel sauce or use a sugar-free option. To Keep This Paleo: Use my recipe for homemade Salted Coconut Caramel Sauce (recipe here: https://www.anediblemosaic.com/salted-coconut-caramel-sauce-paleo/), and use almonds instead of peanuts.